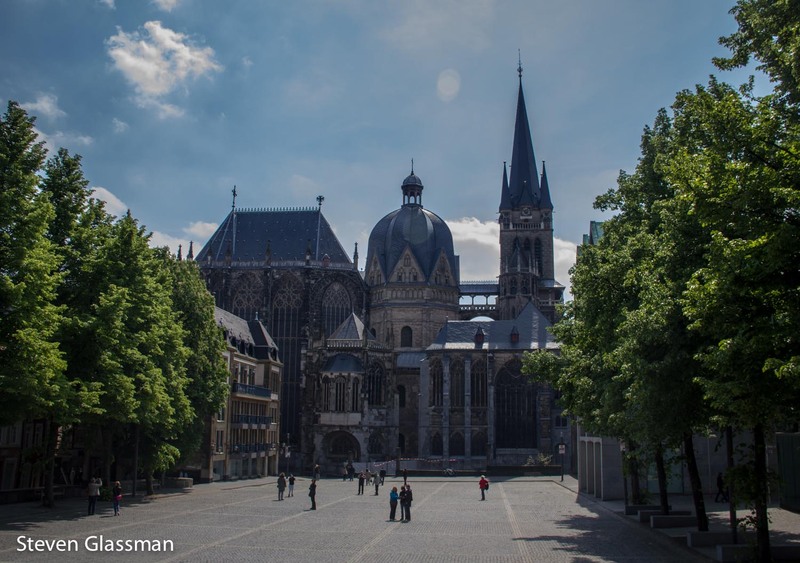 The Palatine Chapel, Aachen – Sunshine. Whimsy. Tacos. 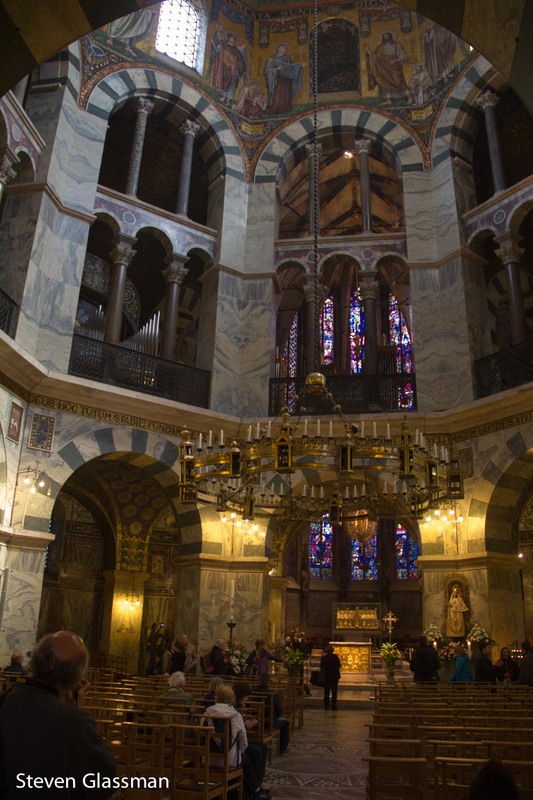 On the way back from the Netherlands, we stopped in Aachen specifically to check out the Palatine Chapel and the Aachen Cathedral. 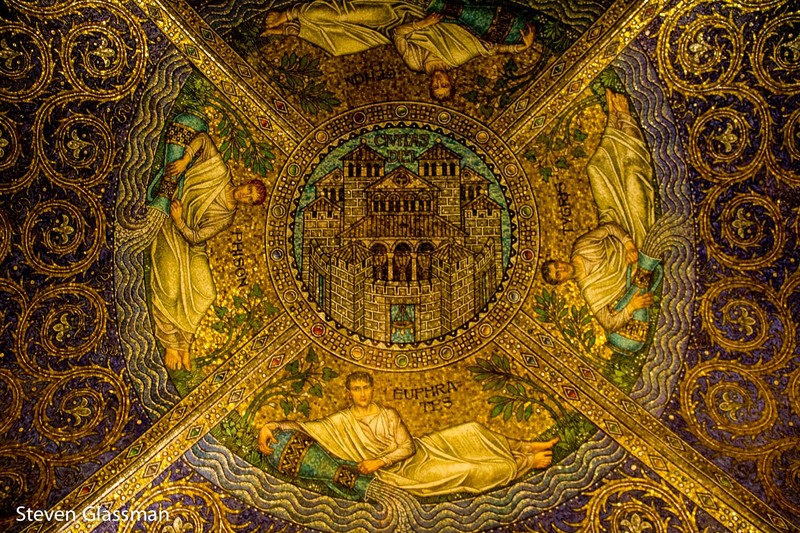 The Palatine Chapel is an early medieval chapel which was originally part of Charlemagne’s palace. 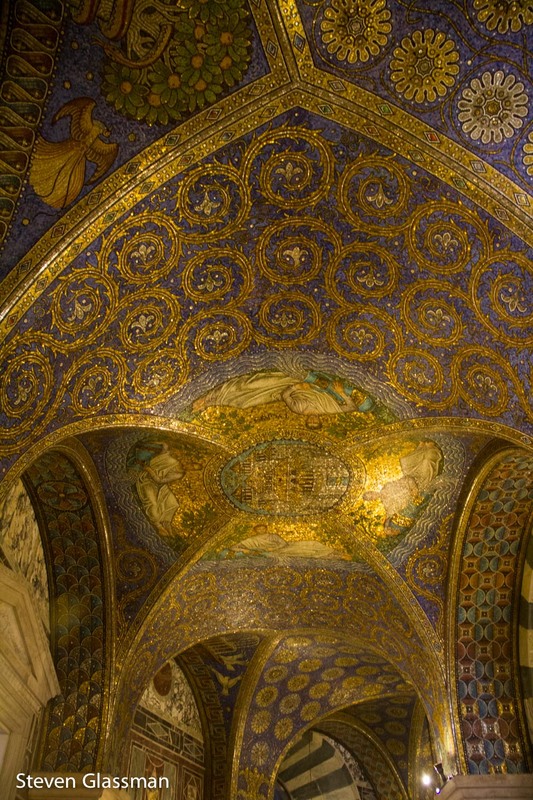 Most of the palace no longer exists, but the Chapel has been incorporated into Aachen Cathedral. 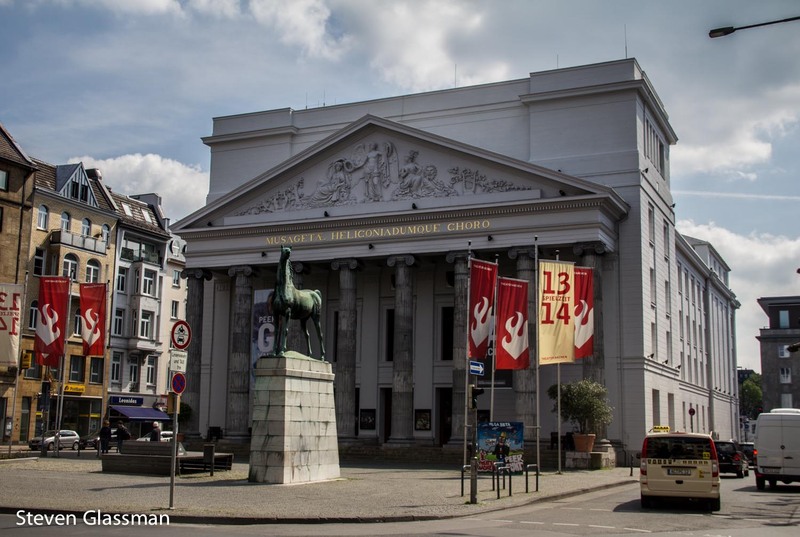 This building is Aachen’s theater, and has nothing to do with the Cathedral. 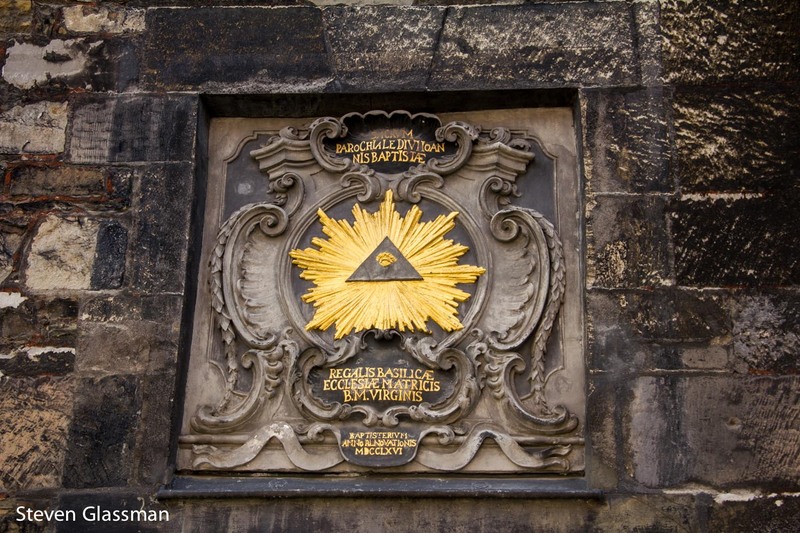 This is part of the wall just outside the Chapel. When we arrived, it was about fifteen minutes before the Chapel would be open for visitors so we walked around a bit. 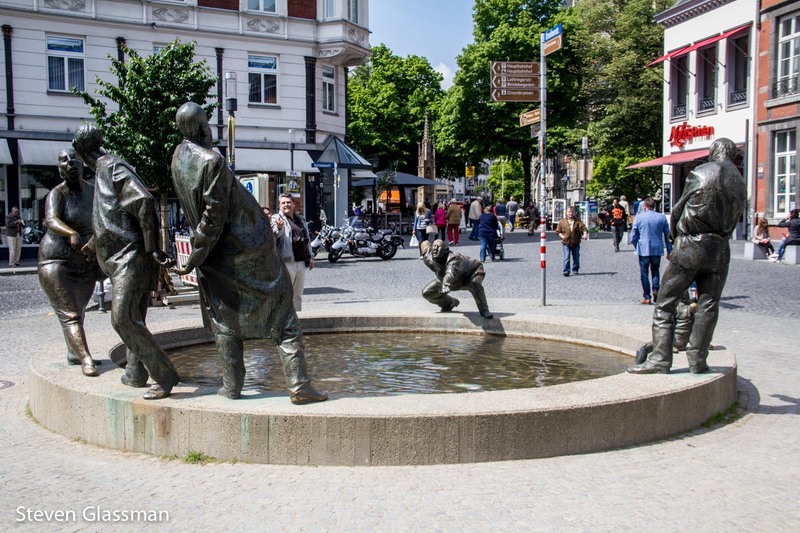 A statue near to the cathedral called The Circle of Money. 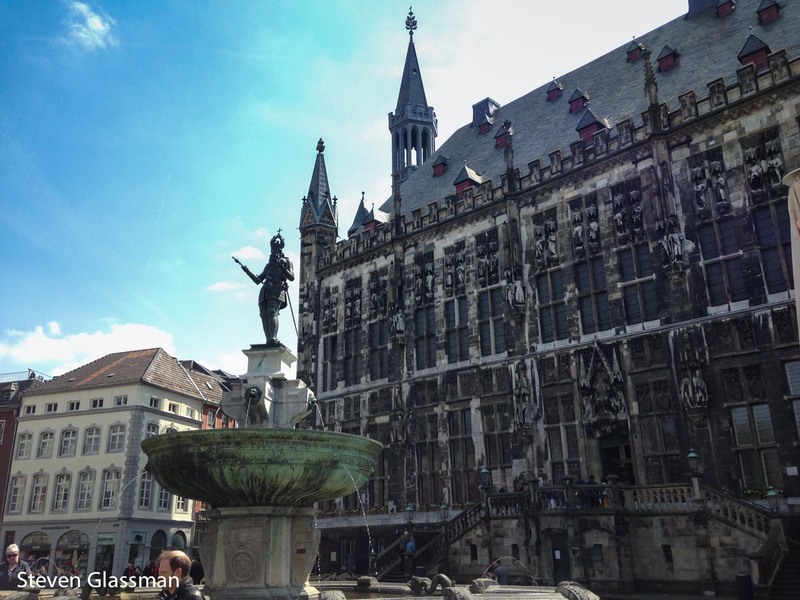 This is the Aachen Rathaus (town hall), across from the Aachen Starbucks. 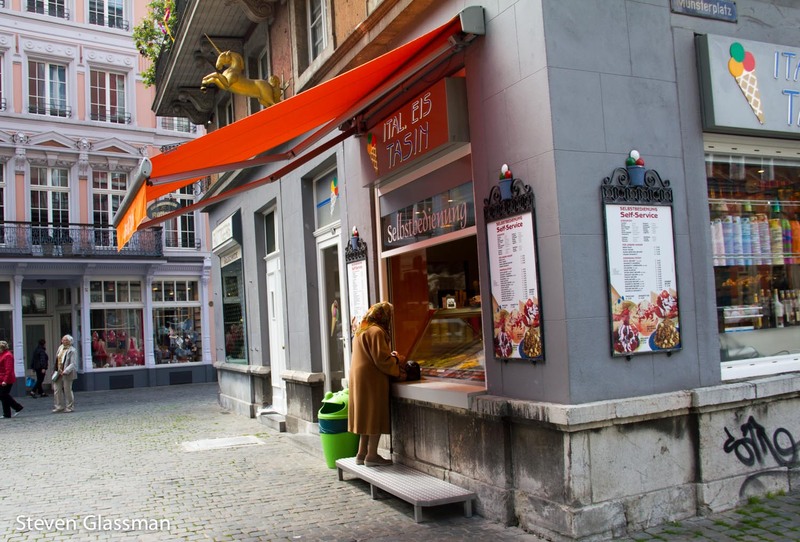 Germans really do love their ice cream. The Chapel opened at 12:30 and we were inside soon after. 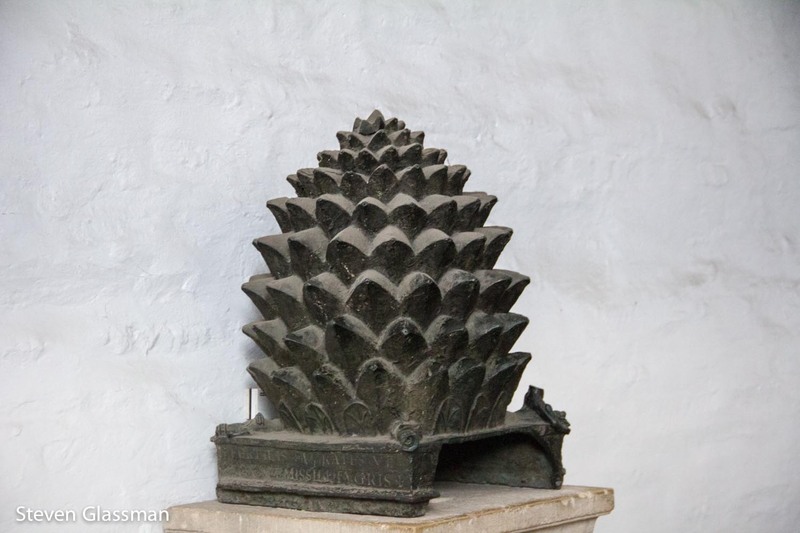 In the main entryway, there are pine cones dating from the year 1000. 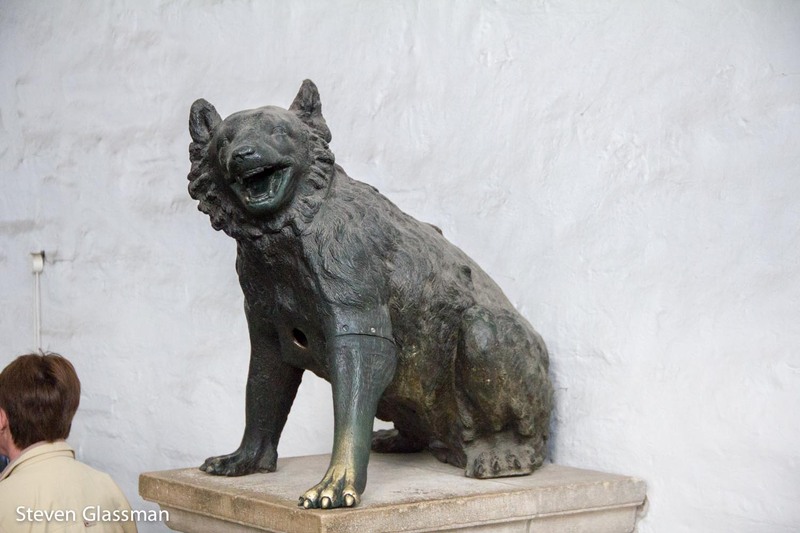 This is the “She-wolf,” a Roman female bear from the 2nd century. Recent research has dated this sculpture back to ancient Greece, claiming that it is part of a hunting scene. The Cathedral administrators charge you €1 to take pictures with your own camera. When you pay, they put a green band on your camera strap to indicate that you’re allowed to be taking photos. This seems entirely reasonable to me. 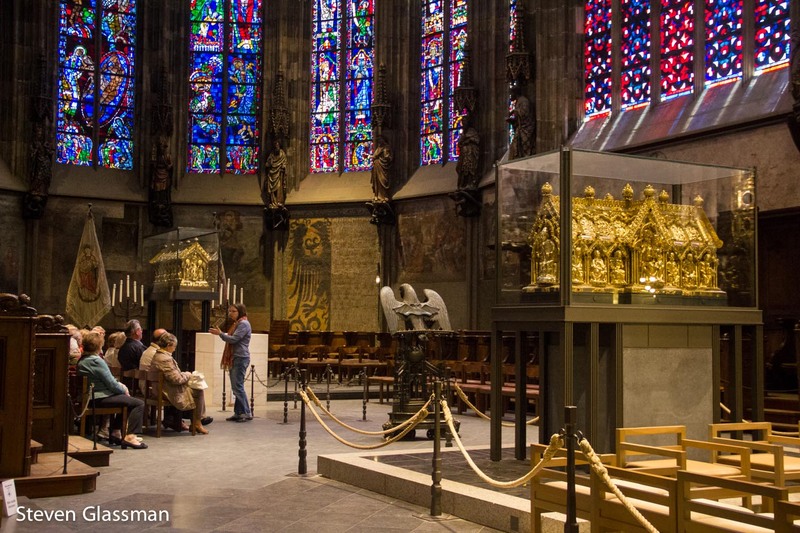 This is the main octagonal part of Charlemagne’s chapel. The main structure dates back to roughly the year 800. The ceiling of the Chapel. Stained glass with several items visible on the altar. I’ll come back to these. Detail in the ceiling near the main entrance. The gold box closest to the camera is the Shrine of St. Mary. 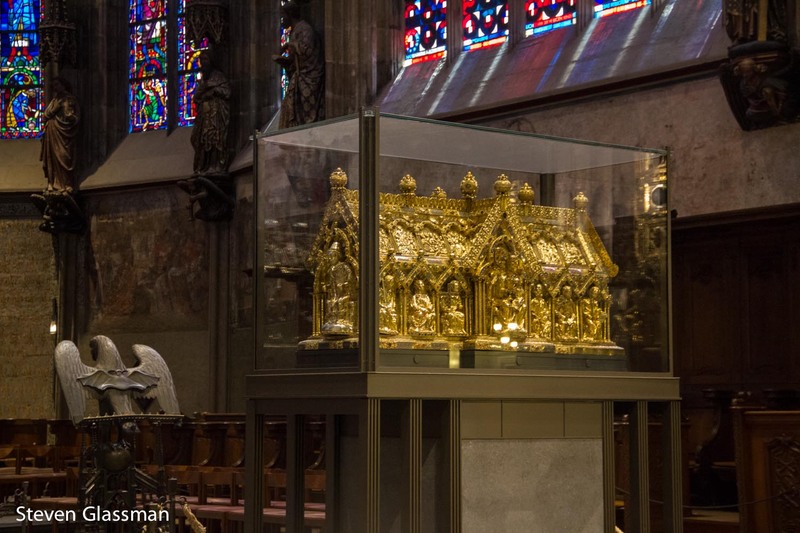 It contains four Aachen relics, which are taken out every seven years and put on display. Behind that is the Adlerspult (Eagle stand), a brass music stand in the shape of an eagle. 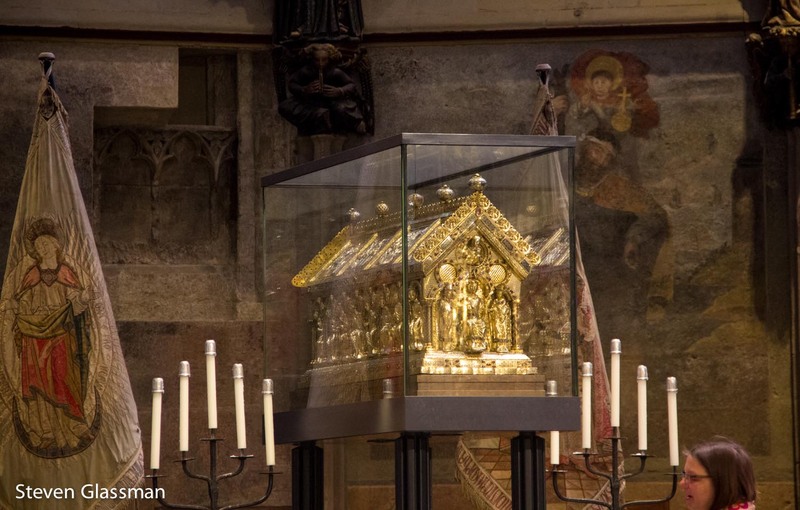 The furthest gold box back is the Shrine of Charlemagne, and it contains the remains of Charlemagne, who died in the year 814. The Shrine of St. Mary and the Adlerpult. In the gallery upstairs is Charlemagne’s throne. (Thanks to Robert for taking this picture. You had to join a tour to go upstairs, and he did.) 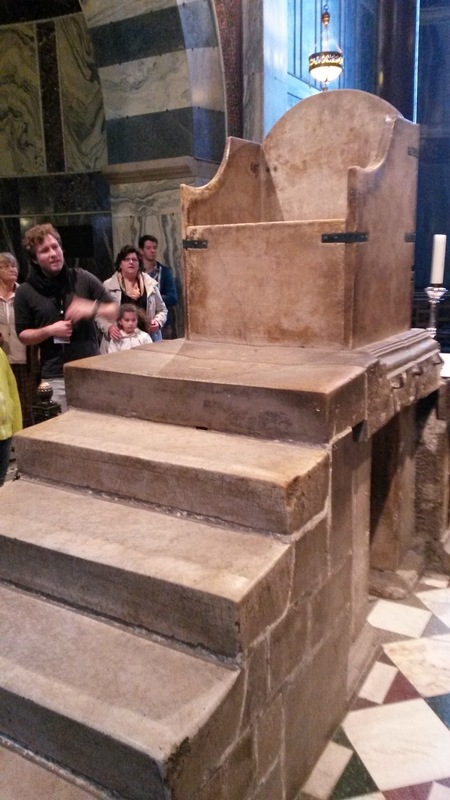 Originally, the throne was white marble, but it was covered it in tar paper after the war and buried in sand- a bomb attack blew out all the windows and they were doing their best to cover the inside from the elements. The tar paper has left stains on the marble and these will not be cleaned for fear of damaging the marble. 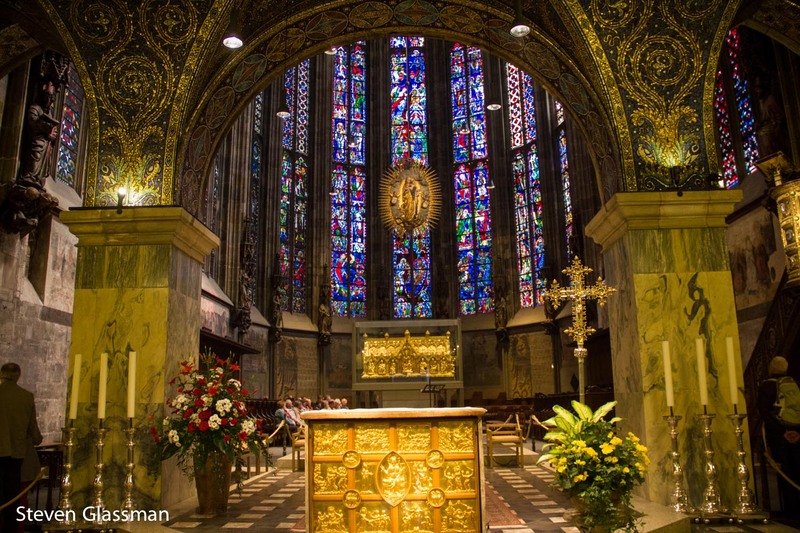 This is the Aachen cathedral in its entirety. The rounded cupola in the center is the portion containing the Palatine Chapel. 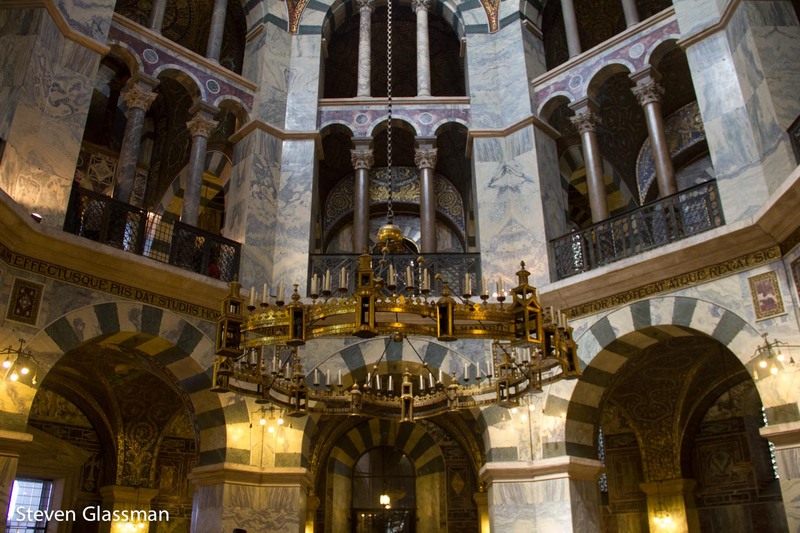 Have you ever been to the Palatine Chapel? The photos of the ceiling are really beautiful!! These are all lovely photos, but the one of the little old lady standing on a makeshift step to order ice cream is adorable. 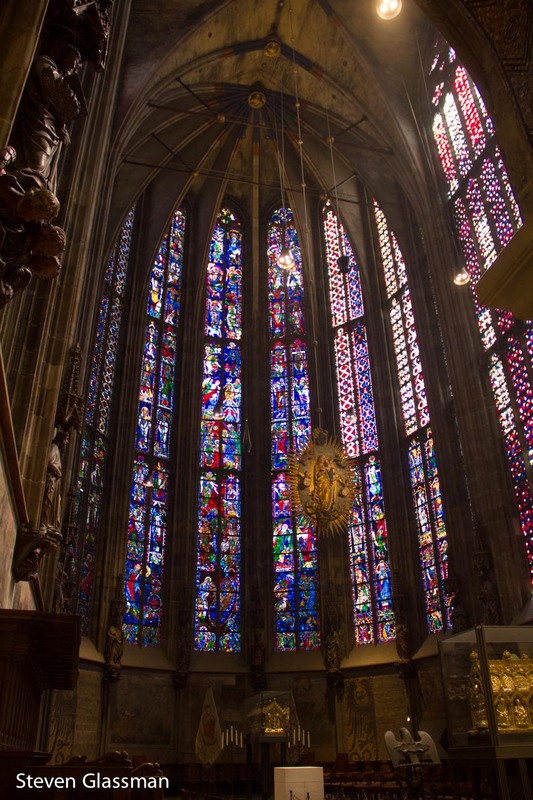 Fun fact about the chapel – most of the interior has been white up until ~100 years ago when another German emperor decided, that he liked the fancy stuff more than the pure white in which most of the inside was covered.